Vancouver, British Columbia: September 14, 2017. Triumph Gold Corp., (TSX-V: TIG) (OTCMKTS: NFRGF) (“Triumph Gold” or the “Company”) announces the completion of its 2017 field season. The 2017 exploration campaign began in late May and focused on the Company’s 100% owned, road accessible, Freegold Mountain property, located approximately 80 kilometres northwest of Carmacks, Yukon Territory, Canada. Work on the property included thirty-five diamond drill holes totaling 12,904 metres in the Revenue and Nucleus areas, over 600 metres of trenching and collection of 993 soil samples at Tinta Hill, and reconnaissance work on a dozen other showings and prospects. In addition to work conducted by Triumph Gold, geological mapping of the property and surrounding area was supported by the Yukon Geological Survey and conducted by researchers at the Mineral Deposit Research Unit (MDRU) of the University of British Columbia. Triumph Gold geologists also conducted reconnaissance mapping and sampling on their 100% owned Severance (YT), Tad/Toro (YT), and Andalusite Peak (BC) properties. Geochemical results from the 2017 field season have been considerably delayed compared to previous years due to the exceptionally high volume of samples being produced in Yukon. During the second half of the exploration program samples were shipped to Thunder Bay rather than Whitehorse for more expedient processing. Geochemical results from drilling and other sampling programs will be released in the upcoming weeks as the data are received and reviewed. 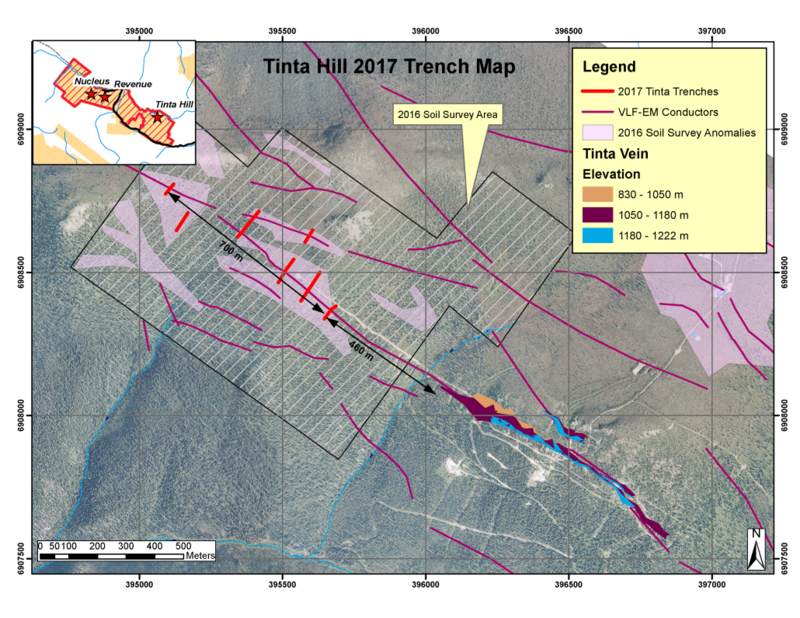 Tinta Hill is a polymetallic vein deposit with a current inferred resource of 2.16 million tonnes grading 1.89 g/t gold, 54.9 g/t silver, 0.27% copper, 0.99% lead and 1.41% zinc at a 0.5 g/t gold cut-off grade (December 15, 2014). The vein tapers and pinches out to the NW of the resource area. However, soil geochemical and VLF-EM surveys conducted in 2016 identified coincident multi-element soil anomalies and conductors along strike of the Tinta Vein (see press release dated February 27, 2017), beginning approximately 460 metres to the NW of the mapped extent of the Tinta Vein and encompassing an additional 700 metres, along strike, to the limit of the soil survey (see map below). The area was tested in September of this year with seven trenches. Six of the seven trenches exposed multiple strongly clay and hematite altered zones with pyritic quartz veins and silicified domains that range from less than 1 centimetre to 2.6 metres in width. The mineralized veins are heavily leached and boxwork after sulfide-rich quartz veins/silicified domains is common. Where quartz veins with remnant sulfides are preserved, they contain up to 15% pyrite, and in six locations chalcopyrite, malachite and/or galena were also observed, confirming base metal mineralization similar to the Tinta Vein. Based on mapping of the 2017 trenches, it is now apparent that an altered and veined structure, similar in character to the Tinta Vein, is present over at least a 700-metre extent along strike of the Tinta Vein. The geochemical results of 73 chip and 18 grab samples collected from the trenches are expected in approximately five weeks. The Company also announces the appointment of Mr. Rakesh Patel as Chief Financial Officer. Mr. Patel replaces Glen Diduck, a founding director of the Company, who has resigned to focus on other business ventures. The Company wishes to acknowledge Glen’s contribution and thank him for the past 11 years of service. Rakesh Patel is a partner in the Audit and Assurance Group at DMCL Chartered Professional Accountants. He provides audit and advisory services to Canadian and US private and public companies. He specializes in guiding private companies entering the public markets and assisting them with the registration process. He also has extensive knowledge of Canadian and US securities rules relating to the public markets, initial public offerings, prospectuses and mergers and acquisitions.